Cats may have arrived in Australia before European settlement by escaping from fishing vessels trading with northern Aboriginal communities or by swimming ashore from shipwrecks which occurred along the Western Australian coastline in the 17th century. They were also released into the wild in Australia during the nineteenth century to control mice and rabbits. The survival of cats was aided by an abundance of fauna in the cats preferred prey size (30 – 5500g) and their ability to survive in arid areas. Feral cats range in size from 3.5 to 6.5kg for males and 3.4 to 4.5kg for females, although larger specimens are occasionally caught. The maximum recorded weight of a feral cat captured by Animal Pest Management Services is 7.9kg. Tabby is generally the most common coat colour, although black and ginger can be common in some areas. Feral cats are nocturnal hunters and either “sit and wait” or stalk their prey. They are capable of killing prey up to their own body size and kill by biting the throat or base of the skull. Adult feral cats are solitary except during breeding seasons and occupy home ranges of between 1-10km. Home ranges may be extended during times of food shortage. Female cats become sexually mature at 10 months of age and are capable of producing two litters of 2-7 kittens per year generally between spring and autumn (although this may vary from area to area across Australia). Feral cats have been implicated in the decline of a number of Australian terrestrial vertebrates. They are thought to have contributed to the extinction of a number of small to medium sized ground-dwelling mammals and ground-nesting birds in the arid areas of Australia. There are 37 species of endangered and threatened (vulnerable) Australian native fauna considered at risk from feral cat predation. 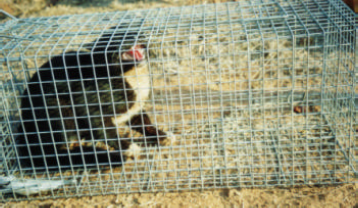 Feral cats are controlled by trapping and shooting. Exclusion fencing is an expensive but vital tool in high conservation areas such as fauna recovery or conservation areas.